Hello ooh I am having so much fun with little Luca. We are just getting ready to flea the house to some animal farm but I wanted to quickly remind you that today is THE LAST DAY to take advantage of the SALE A BRATION promotion. For every £45 spent you get one FREE stamp set. 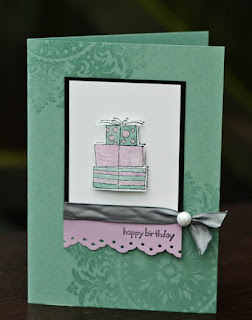 This beautiful card was made by the lovely Joanne, she choose to case one of my display board samples but changed the colours to her favourite of Sage Shadow and Pale Plum, with the added black it makes for a stylish combo. And Carol choose to replicate another of my samples she cut parts of the cake from the Happy Moments set to make a taller cake. 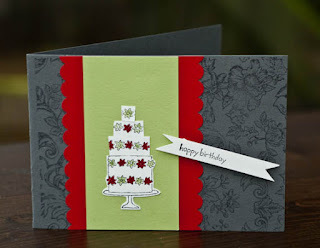 And I found THIS stunning card on Liz's blog. My jaw dropped to the floor when I saw it, my favourite birdcage image coupled with the beautiful Baroque Motifs just how well they work together? I absolutely love it Liz. One question though, how'd you get the pearl to stick on the ribbon on the first card? ?